I recently had the opportunity to guest post at at Seamingly Smitten for their Sew Crafty Christmas Event. I was thrilled to have the opportunity create a tutorial for the Event. The Sew Crafty Christmas Event is going on Dec. 5th through the 16th and has some great guest bloggers lined up with great giveaways every day. I would like to share an easy little project I put together just for you. It is a tutorial for a Wine Gift Bag. Just a little project that can be done in a very short amount of time, but will add just a little something special to any gift. 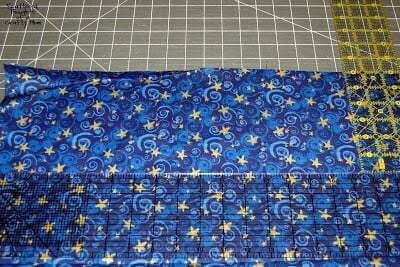 Next, flip your fabric and fold it right sides together and sew up the long sides using a 1/4 inch seam allowance. Do this for both sides. Clip the corners of the bottom as shown, taking care not to cut into your seam. Flip the bag right side out. 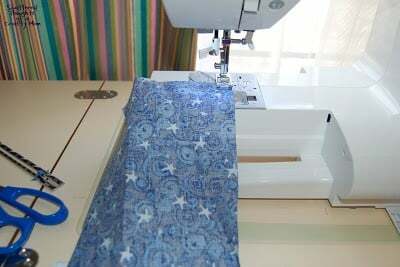 Use a pencil or turning tool to help turn the corners of the bag. Fold the top edge over 1/2 inch and press. Pin if needed. Sew a straight stitch 1/4th inch from the folded edge. Be careful not to catch the other side of the bag in your stitches. Next fold the top side in again, this time 2 1/4 inches. 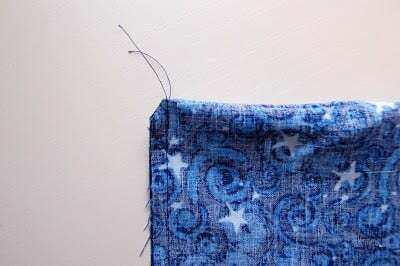 Press well and sew a straight stitch 2 inches from the fold. You will probably need to manipulate your fabric around since the opening might be too narrow to fit around your machine. (Mine was.) This stitch should catch the folded inside edge. Finally, cut a strip of ribbon to about 20 inches in length. Tie a pretty bow around the bottle neck. Tada! You’re done! 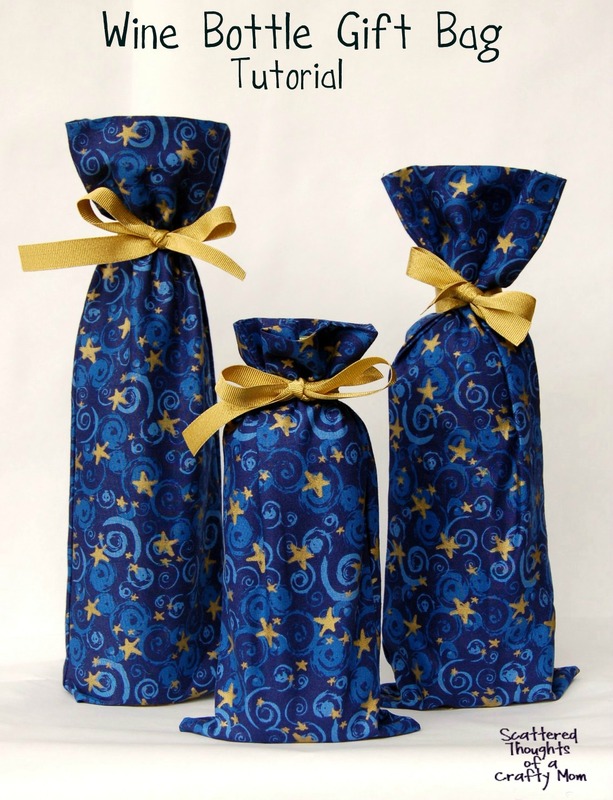 A cute little gift bag, which could be used for many different sized gifts, not just wine bottles. All you would need to do is to adjust your measurements! Can I tell you a secret? I tried a little experiment… The striped bag is made completely with hot glue! Yep, hot glue, no sewing at all… So I guess this could be a no-sew project too! I had fun making these bags and I hope you will too. I will be linking up to some of the fabulous linky parties listed here. This is wonderful!!! I've been wanting to make my own as thank you gifts for friends and family! I'm actually giving away a really cute one on my blog this week, you're cordially invited to stop by and enter! I love yours, they're lovely! Neat project and thanks for showing that you can glue if you need/want to! Super cute! I love the fact that this could be a "no sew" project also. Thanks for sharing. Really pretty, thanks for testing the glue option I never would have thought to try that. Jamie, this was featured on Craft Gossip!! WOOHOO!!! Congratulations!! 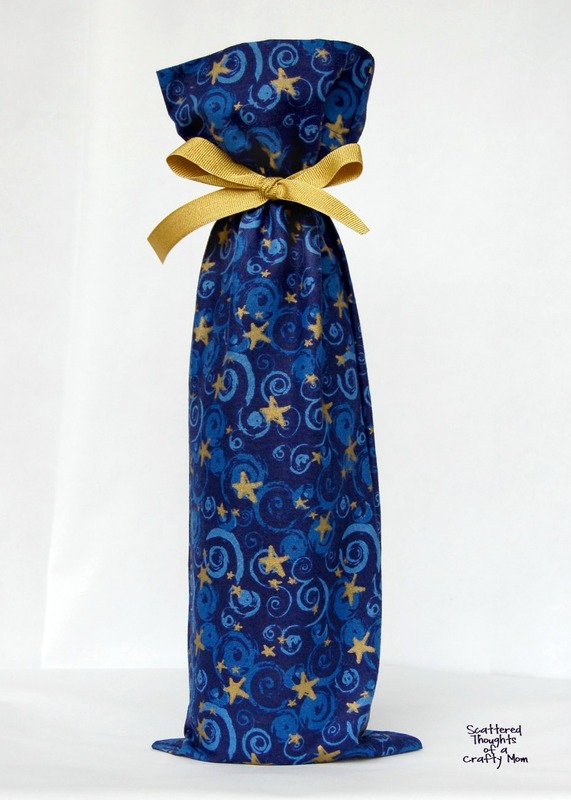 LOVING the wine bottle gift bag! This is EXACTLY what I needed to see! 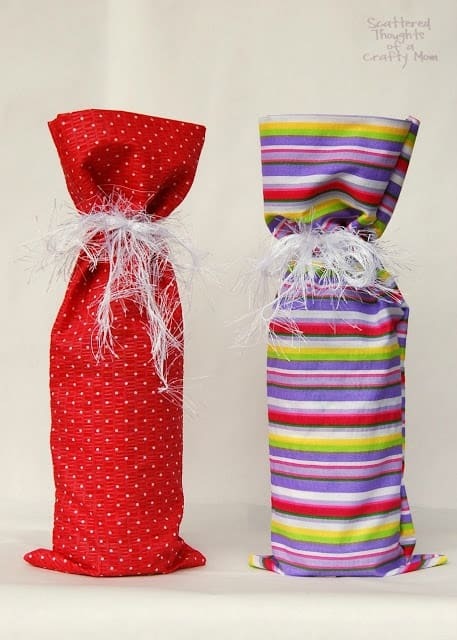 My dad wants wine for Christmas, and I NEEDED to find a tutorial to make two; THANKS! What cute bags to put bottled gifts in. I also like how easy, yet lovely project it is. Gift bags can be expensive, so this is a great alternative. Thanks for showing us how. Please post this at Sunday's Best today at 4 pm. these look very cute. a great way to use some larger fabric scraps! Oh, I have two bottles of wine to give in January. Must make these! Those are so adorable. I used a sewing machine when I was in junior high and that's the last time I went anywhere near one of those machines. Sometimes half the fun of gifts is the creative wrapping people use. Thanks again for sharing, I made a few last night, but did mine in felt. Looks so cute. Thanks for sharing over at Sunday's Best and letting us see your creative side. What a great project. And I love that it can be re-used. Thank you so much for linking it to Fabulous Friday.